It happens every year. Kate Middleton sashays down the red carpet at the BAFTAs and totally steals the style show. She doesn’t wear a tiara to the British Academy of Film and Television Arts award show, which is as important as the Oscars across the pond. But she always wears super dazzling jewels. Remember that suite of emeralds she sparkled in last year with the Jenny Packham gown? Or the unbelievable diamond pendant earrings she wowed everyone with in 2017. Besides being pretty big statement jewels, the other detail these pieces have in common is that they were private gifts. In other words, no one knows where she acquired the jewels or even who made them. This year Kate went a different route choosing pieces with exciting provenances. The South Sea pearl and diamond earrings she had on were Diana’s. Royal experts believe, it is the first time Kate has been seen in them. Pearls were Diana’s favorite gem and she wore these earrings on several occasion including at an event in New York at the United Nations when she accepted a humanitarian award from Henry Kissinger. Astute observers of Diana’s collection have noted Kate swapped the round pearls for more oblong gems from Diana’s Collingwood pearl set. The quatrefoil diamond bracelet is a piece that Kate has worn on a few occasions. It comes from the Queen’s collection and is on permanent loan to the Duchess. The wide bracelet is believed to have originally belonged to the Queen Mother. 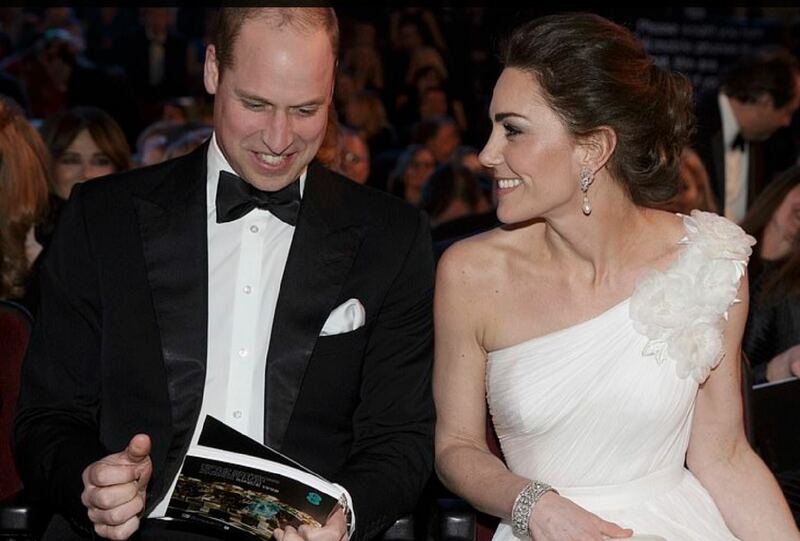 Kate matched the splashy diamond jewels with a sleek one-shoulder white gown. The dress is thought to be by Alexander McQueen, Kate’s go-to label for stylish events.